Situated in the beautiful Old Barossa Goldfields this "Heritage Listed" farm cottage has been fully restored to retain its heritage charm and appeal. Enerby Farm Cottage is situated in the old Barossa Goldfields, the cottage is part of other historic farm buildings which make up this collection of early Australian farming, on approximately 10 acres. Enerby Farm Cottage is a heritage listed stone cottage circa 1900. 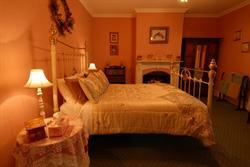 Enjoy two bedrooms, both with brass/iron queen size beds, furnished with a country cottage feel. The living area has a galley kitchen with full size stove and oven, microwave and most kitchen utensils one would need. There is a two seater sofa and a two and a half seater sofa bed. Some other features include an open fire place, reverse cycle air-conditioner, colour television, a DVD player and a stereo system. There are plenty of magazines to read and a few games to play as well. There is a cottage garden in front with lavender, rosemary and cottage plants. From the verandah there are far reaching views down the valley with the Barossa ranges in the distance. With full breakfast provision. The Barossa Goldfields Trail and Para Wirra Recreational Park are only a short walk away. Nearby is the Barossa Reservoir with its well known Whispering Wall and of course the vineyards of the famous Barossa Valley. 2 queen beds and 1 double sofa bed. Full breakfast provisions are included.